Another piece of the proto-cyberpunk puzzle is found. So far, proto-cyberpunk media has dealt more with the themes of cyberpunk. But what about the look, that Blade Runner-esque future with stratosphere busting skyscrapers and flying cars? Did Ridley Scott have that vision in his head all along? As it turns out, there was a major influence that would spark the future visions of Scott and Gibson: A short comic about a private eye (or “nose” as the main character called himself) who is hired to retrieve a package. The story itself isn’t much (too short to call it a novel), but the artwork is what influenced Scott and Gibson. Fritz Lang and the Germans beg to differ. My advice: Check both out and see who had the future first. 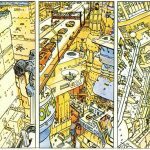 This post has been filed under Proto-Cyberpunk Media, Cyberpunk Books, Graphic Novels by Mr. Roboto. Cyberpunk before cyberpunk. Before the word was ever coined, John Brunner created a world so close to what we now consider to be ‘cyberpunk’ that it needed to be read to be believed. It has a computer network that virtually… and literally… permeates American society, while secret government projects try to squeeze the best minds for all their knowledge to try to monitor a society uprooted by a massive west-coast earthquake. About all that’s missing are the cybernetic implants, although there are bio-engineered people and animals that seem to behave almost human. 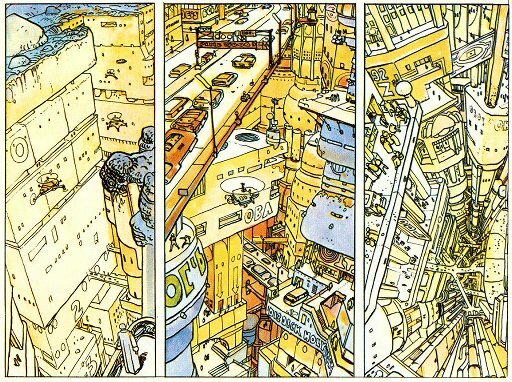 What you have is THEE definitive blueprint of cyberpunk, even though nobody knew it for another decade. Synopsis: The Pacific coast finally experiences “The BIG One” that kills millions and displaces millions more leaving them with nothing to live on except welfare. Meanwhile, the rest of the nation is experiencing their own kind of “overload” as varying levels of data access has left some without a permanent residence while the “privileged” live in their own kind of haven. To help cope (or, more like, to exploit) this flux, the US Government, under control of criminal elements, began programs to identify potentially “gifted” students to cultivate their “wisdom” to further the Government’s cause. Between the regression flashbacks and the moral point/counterpoints, we see how Nickie managed to elude the authorities while making a living (several, actually) using the skills he learned at Tarnover… and why he ran away to begin with. That’s right, worms! Those self-propagating programs that hog bandwidth are the result of this book. Nickie programmed his worms to erase all traces of his old identity and to create new ones when needed. He also creates a “super worm” that discloses information that the government has been trying to keep secret. 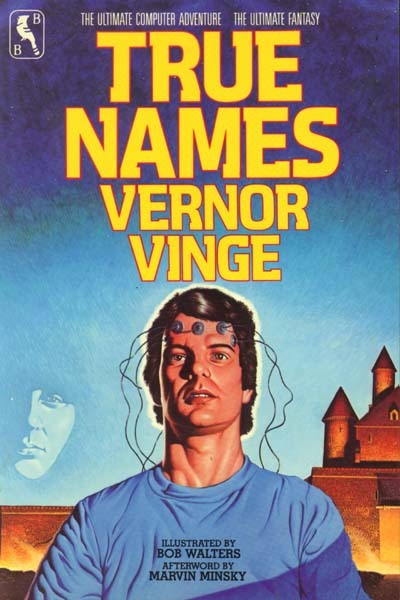 Another proto-cyberpunk classic for your bookshelf. Make some space next to True Names in your library. 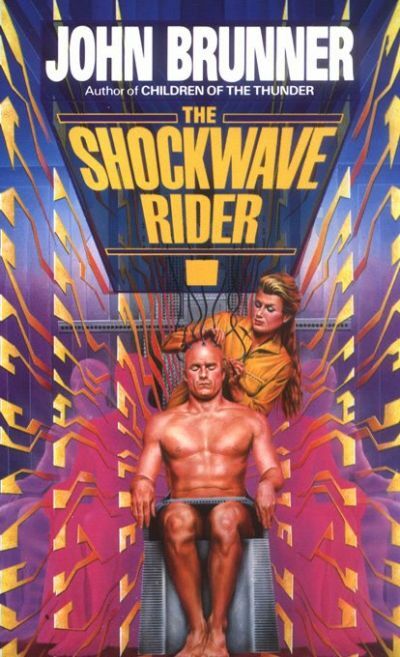 The Shockwave Rider is a book that must be in your collection. 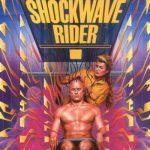 This post has been filed under Proto-Cyberpunk Media, Cyberpunk Books by Mr. Roboto. In the once upon a time days of the First Age of Magic, the prudent sorcerer regarded his own true name as his most valued possession but also the greatest threat to his continued good health, for–the stories go–once an enemy, even a weak unskilled enemy, learned the sorcerer’s true name, then routine and widely known spells could destroy or enslave even the most powerful. As times passed, and we graduated to the Age of Reason and thence to the first and second industrial revolutions, such notions were discredited. Now it seems that the Wheel has turned full circle (even if there never really was a First Age) and we are back to worrying about true names again. This opening paragraph pretty much describes the premise of True Names. 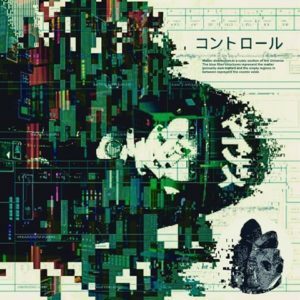 This novella, released three years before Neuromancer, gives us a cyberspace adventure that has influenced many a cyberpunk writer… possibly even Gibson himself. Synopsis: Roger Pollack is a computer wizard who frequents the “Other Plane” as “Mr. Slippery” and has other wizard friends whose “true names” are kept secret, even from each other. He is confronted by agents of “The Great Adversary” (The US Government) who has reason to believe that another wizard named “The Mailman” is recruiting other wizards for some type of coup on the net that can lead to control of reality. 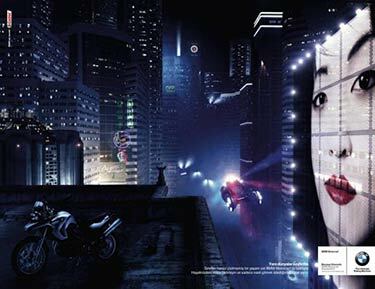 Everything you’d expect from cyberpunk… and then some. The “Other Plane” connects to many nets, nodes, and databases. Anyone who has the ability to connect and control them can become a virtual god, and when Mr. Slippery finds out who… or what… The Mailman is, you’ll understand why this novella is definitely cyberpunk. Don’t believe me? Read it online. (BIG ACK signal to “The Rectifier,” though I have yet to find the zip file he mentions.) 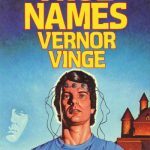 You can still find the story for sale by itself, mostly online, or as part of a collection like True Names & Other Dangers and True Names: And the Opening of the Cyberspace Frontier. Read it and see how cyberpunk it is!